Total milk production in New York was 14,765 million pounds in 2016 (NYS Department of Agriculture and Markets, 2017). In 2018, New York State had the 3rd highest number of milk cows behind California and Wisconsin, with 625,000 cows (USDA NASS, 2018). Dairy manure excretion averages 12,821,616 tons per year in NY state alone (NYS Department of Agriculture and Markets, 2017; NRCS, 2018). This translates into 64,108 tons N, 38,465 tons P2O5, and 44,876 tons K2O (SARE, 2018) which can be recycled back for agricultural and horticultural use. In places where available manure nutrients exceed the needs of nearby field crops, the challenge becomes offsetting transportation costs. Unfortunately, these transportation costs can at times equal the manure’s value as a fertilizer (Pennington et al.). Manure management generates 44% of total methane emissions on dairy farms (Wright et al., 2017). A more potent greenhouse gas than CO2 by 34-fold (Pronto et al., 2017), methane can be captured in anaerobic digesters for use as a fuel. Since 1998, 34 anaerobic digesters for dairy manure were installed and are operating across the state (EPA AGstar, 2018). These digesters facilitate a reduction in methane emissions by 1,502,327 MT CO2 equivalent units per year (EPA AGstar, 2018; Pronto et al., 2017). Methane biogas is just one of the products generated in anaerobic digesters. The remaining digestate of wet reactors is comprised of partially-degraded biomass and nutrients, and contains up to 16% solids (Ward et al., 2008). Plant nutrients are concentrated by the microbial activity. Notably, ammonium nitrogen increases by up to 33% (Möller et al., 2008; Möller and Müller, 2012). The digestate slurry can screw-pressed to separate solids from liquids and recycled into useful products such as bedding or organic fertilizers. The solids can be further stabilized against decomposition through pyrolysis. Heating under oxygen-free conditions, known as pyrolysis, converts biomass into a charcoal-like substance called biochar. During this process, carbon chains fuse into rings (McBeath et al., 2014). 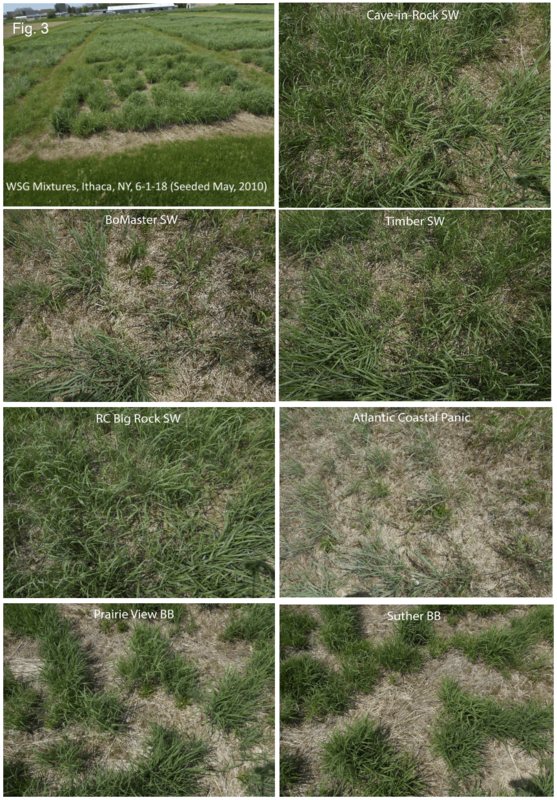 These substances resist decomposition in the soil, and can even slow the decomposition of non-biochar carbon (DeCiucies et al., 2018). As pyrolysis temperature increases, biochar surface area increases along with pH (Mukherjee et al., 2011). Generally speaking, pyrolysis concentrates plant nutrients when compared to the biomass feedstock (Enders et al., 2012). 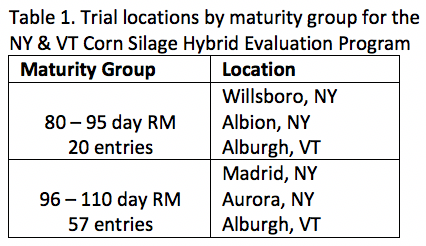 This research project, sponsored by the U.S. Center for Dairy Innovation, enabled an assessment of upgrading anaerobically digested, screw-pressed dairy manure into a higher value biochar product. In summary, dairy manure biochar is an odor- and pathogen-free, nutrient-rich fertilizer with approximately twice the nutrient content of the original manure by mass, and more than three times that by volume. 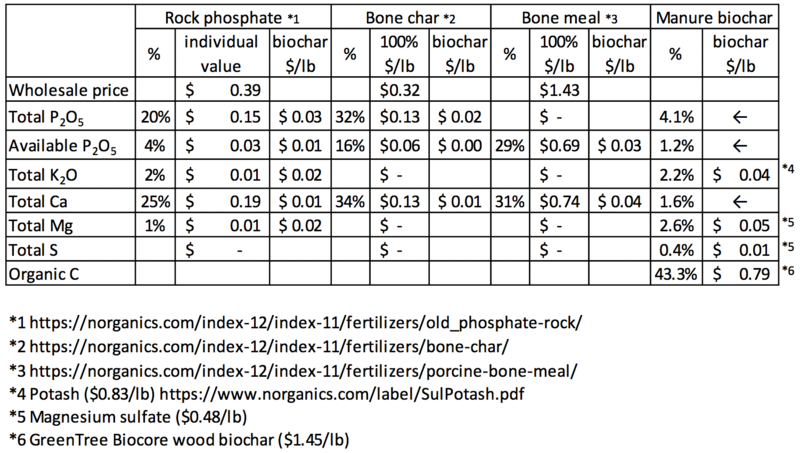 The nutrient value of the biochar as a substitute for other organic fertilizers was calculated as $240-340/ton. In addition, the carbon value as a substitute for commercially available biochar was calculated as $1580/ton. 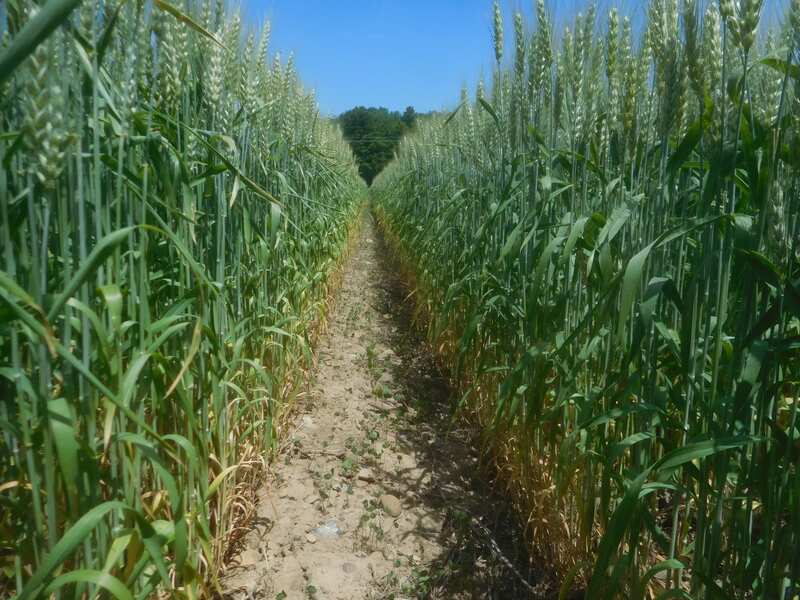 Analyses suggest that over half of the carbon in the resulting biochar is stabilized to benefit soil fertility and carbon sequestration for over a century after application. Anaerobically digested, screw pressed, dairy manure was sourced from a 3000+ head New York dairy farm. Initial moisture content was 59%. After air drying to 12%, the feedstock was pyrolyzed at a highest temperature of 550 °C for 30 minute total residence time. Biochar yield was 38% of oven dry feedstock weight. Biochar Basic Utility Properties and Toxicant Assessment were analyzed according to the International Biochar Initiative (IBI) Standard Product Testing Guidelines v 2.1. 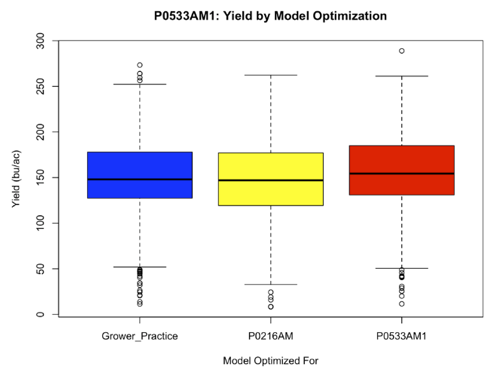 Total nutrient contents of feedstock and biochars were assessed to describe the effect of pyrolysis on plant nutrients. Transformations in nutrient availability of the manure and biochar were investigated with three extractants. Leachable nutrients were determined with a 0.01 M calcium chloride, available with a modified Morgan’s solution (ammonium acetate), and phosphorous with a fertilizer industry standard (2% citrate EDTA). These data were used by our commercial partner, GreenTree Garden Supply, to substitute dairy manure biochar for all of the commercial biochar as well as a portion of fertilizer they use in three of their commercial growing media. The dairy manure biochar is 178% more dense than the manure at 503 lbs/cu yd, with ash content increased to 38%. The IBI classification tool calculates the Carbon Storage Class of this biochar as 1, on a scale of 1-5 with 5 providing the highest carbon storage potential. This rating integrates both carbon quality and quantity. The high ash content of this biochar downplays the quality of the carbon present, hence the low rating. However, the quality of the carbon is such (i.e., low H/Corg ratio) that roughly half is expected to persist over 100 years, compared to practically 0% in the manure. The pH of this biochar is 10.45. More importantly, it has a calcium carbonate equivalence of 3.30%. In other words, 100 pounds of biochar can neutralize acid as well as 3.30 pounds of lime. This falls under IBI Liming Class 1, rated on a scale of 0-3, with 3 relating to the highest lime equivalent. Therefore, this biochar is best suited for mildly acid soils that would benefit from increasing pH. Unlike biochar from biomass, this material possesses a moderate level of soluble salts with electrical conductivity (1:20 w:v) at 1.65 dS/m. 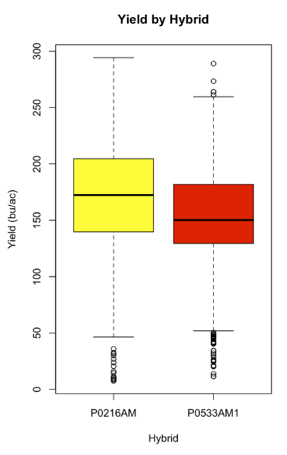 For comparison, soil salinity begins to affect plant growth at levels over 2 dS/m. The Fertilizer Class of this biochar, according to the IBI classification system, is 3 on a scale of 0-4. This is defined as providing adequate nutrition for corn at < 4.5 tons/acre provides for 3 out of 4 nutrients. 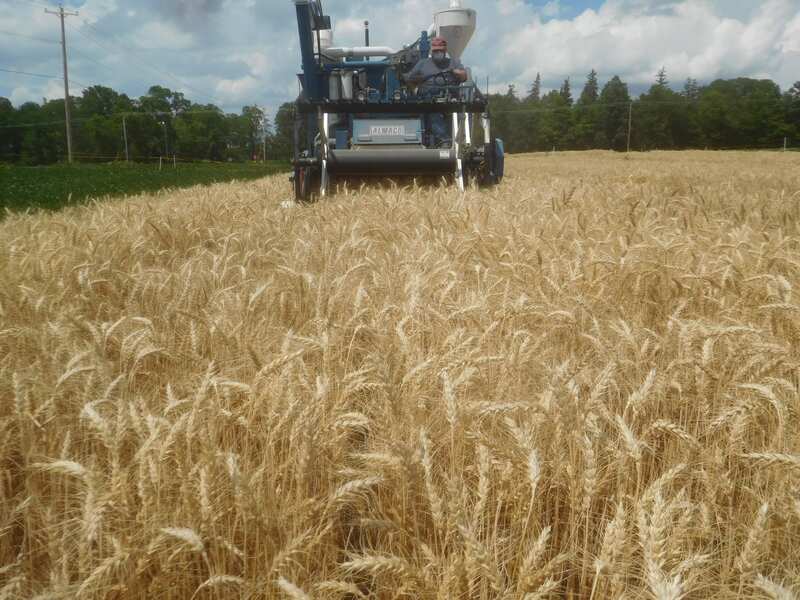 Specifically, the calculation states that phosphorous, potassium, and magnesium requirements are met by application of 4.0, 1.3, and 1.3 tons/acre. The IBI toxicant assessment is understandably quite stringent, screening for persistent organic pollutants: polyaromatic hydrocarbons (PAH), polychlorinated biphenyls (PCB), dioxins (PCDD) and furans (PCDF); toxic heavy metals including: arsenic, cadmium, chromium, lead, mercury; trace elements that become toxic at higher quantities including: copper, molybdenum, nickel, selenium, and zinc; and phytotoxic elements including: boron, chlorine, and sodium. The dairy manure biochar was non-toxic on all counts, and contained 30 times less than the threshold value for any single analyte. A germination trial also assessed biochar toxicity. 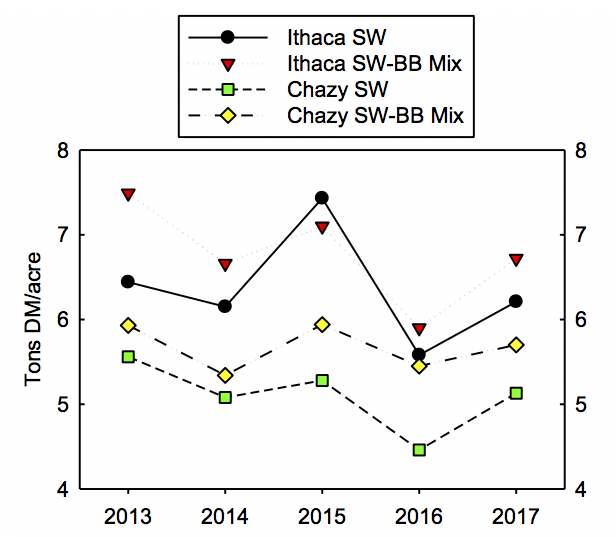 Of the three species used (lettuce, ryegrass, and radish) germination in dairy manure biochar amended media was nearly identical to the control. Biochar contained 4.1% P2O5, 2.2% K2O, and 4.4% MgO. Approximating from biochar yield, nutrient concentration in biochar could be as much 2.6x more than in manure. Gaseous losses during pyrolysis reduced the total content of plant nutrients in the biochar to 1.7x more than in manure feedstock. Sulfur is the most notable example where biochar contained 50% less than feedstock. In addition to increasing total nutrient content, pyrolysis improved nutrient availability, exception for nitrogen and iron. The dairy manure biochar has a nitrogen content of 1.7%, however thermal treatment has converted this to plant unavailable forms and is therefore considered insignificant. Biochar provided 13% more available phosphorous than the manure feedstock with 1.2% of biochar mass as P2O5, i.e. as would be printed on a fertilizer label. Interestingly, increased available phosphorous was coupled with a 10-fold decrease in leachable phosphorous. The biochar also demonstrated 59% more available potassium than the manure with 1.6% of biochar mass as K2O. When all nutrient and carbon content is accounted for, the dairy manure biochar has a value between $0.91 – $0.96/lb (or $1,828-$1,912). 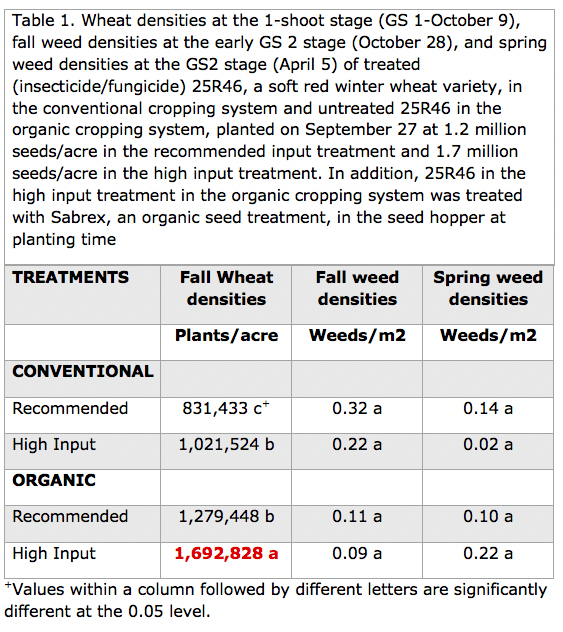 This is calculation is based on the weighted average wholesale price for individual components in commercially available organic fertilizers as below. The majority of value, $0.79/lb, arises from the biochar carbon. 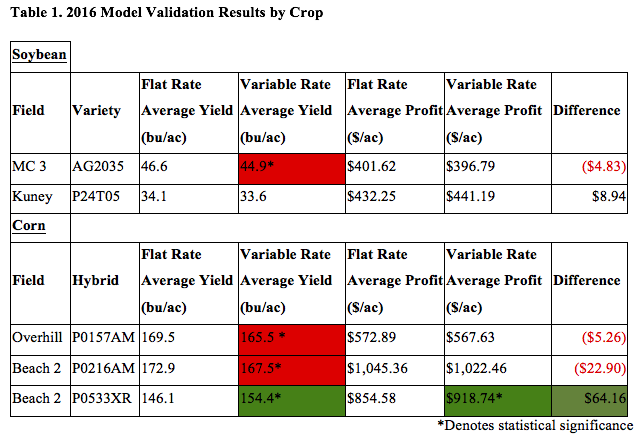 The product evaluation performed by GreenTree Garden Supply substituted all of the commercial biochar (80% C) with dairy manure biochar (43% C) on a carbon basis. The additional nutrient content in the dairy manure biochar reduced wholesale material cost for two products by 2.26% and 0.19%. A practical challenge to biochar production from manure is its moisture content. Waste heat from biogas combustion could fulfill this requirement, given the proper infrastructure. Additionally, pyrolysis coproduct gases could be upgraded and then co-fired alongside biogas for electricity generation to power on-farm pyrolysis. 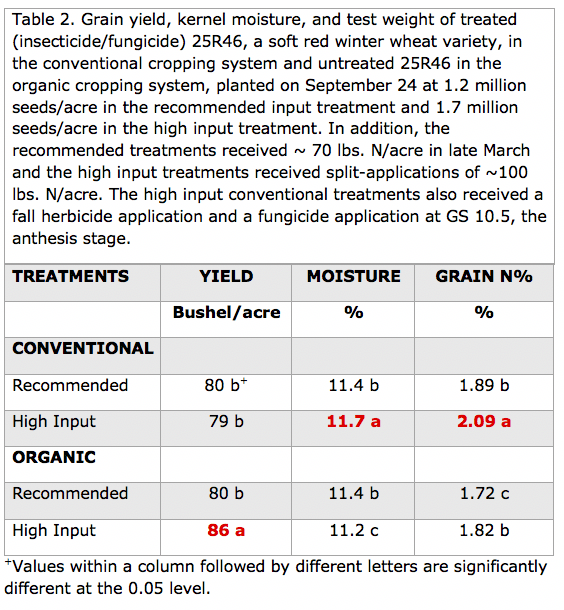 Biochar application to fields would increase fertility and offset nutrient inputs. Organic farming is a feasible commercial application for dairy manure biochar. The biochar is cost competitive with other organic phosphorous sources and organic farmers are accustomed to spreading the larger bulk quantities as fertilizer. Additional fertilizer (especially N) would be blended with the biochar to achieve a desired nutrient balance and concentration and the final product would contain biochar to benefit soil fertility in the long term. Ammonia gas lost from leachate ponds is another resource that can be utilized when biochar is introduced to the system. Biochar has proven effective in adsorbing both ammonium in solution and ammonia gas (Wang et al., 2016). This nitrogen loading can be enhanced with repeated exposure to CO2 to precipitate ammonium bicarbonate (Van Humbeck et al., 2014). Ammonium bicarbonate-biochar fertilizer has demonstrated greater efficiency than synthetic nitrogen alone (Mandal et al., 2016), however commercial production has not yet been achieved. New York State Department of Agriculture and Markets. 2017. New York State Dairy Statistics 2017 annual summary. NYS Agricultural Statistics Service, NYS Department of Agriculture and Markets, Division of Milk Control and Dairy Services, Albany, New York, pp.2. United States Department of Agriculture, National Agricultural Statistics Service. Pennington, J.A., VanDevender, K., and Jennings, J.A., Nutrient and Fertilizer Value of Dairy Manure. University of Arkansas Division of Agriculture, Cooperative Extension Service, Agriculture and Natural Resources bulletin FSA4017. Wright, P., Gooch, C. and Oliver, J.P., 2017. 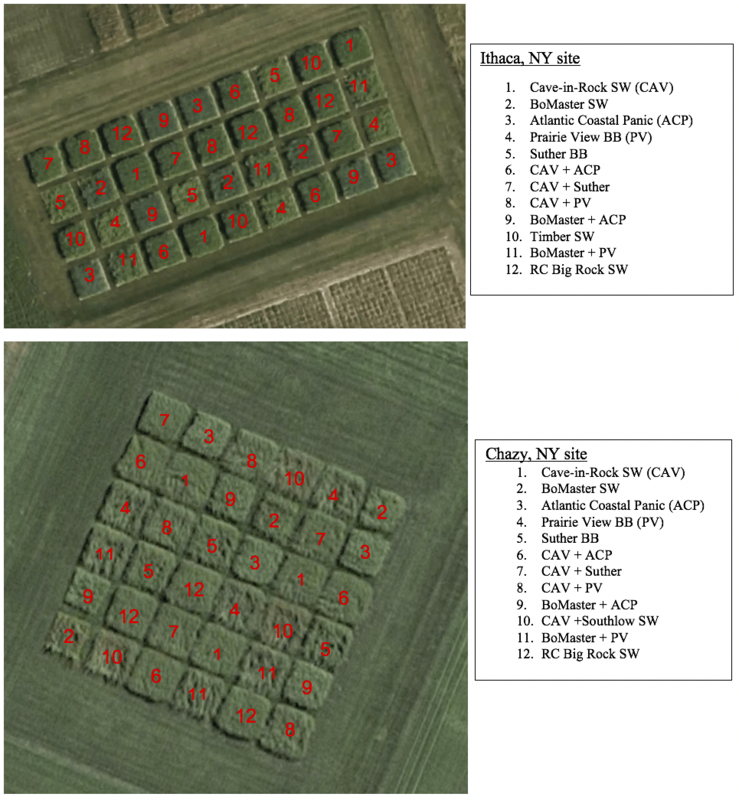 Estimating the Economic Value of the Greenhouse Gas Emission Reductions Associated with on-farm Dairy Manure Anaerobic Digestion Systems in New York State. In 2017 ASABE Annual International Meeting (pp. 1). American Society of Agricultural and Biological Engineers. Ward, A.J., Hobbs, P.J., Holliman, P.J. and Jones, D.L., 2008. Optimisation of the anaerobic digestion of agricultural resources. Bioresource technology, 99(17), pp.7928-7940. Möller, K., Stinner, W., Deuker, A. and Leithold, G., 2008. Effects of different manuring systems with and without biogas digestion on nitrogen cycle and crop yield in mixed organic dairy farming systems. Nutrient cycling in agroecosystems, 82(3), pp.209-232. Möller, K. and Müller, T., 2012. Effects of anaerobic digestion on digestate nutrient availability and crop growth: a review. Engineering in Life Sciences, 12(3), pp.242-257. McBeath, A.V., Smernik, R.J., Krull, E.S. and Lehmann, J., 2014. The influence of feedstock and production temperature on biochar carbon chemistry: a solid-state 13C NMR study. Biomass and Bioenergy, 60, pp.121-129. DeCiucies, S., Whitman, T., Woolf, D., Enders, A. and Lehmann, J., 2018. Priming mechanisms with additions of pyrogenic organic matter to soil. Geochimica et Cosmochimica Acta, 238, pp.329-342. Mukherjee, A., Zimmerman, A.R. and Harris, W., 2011. Surface chemistry variations among a series of laboratory-produced biochars. Geoderma, 163(3-4), pp.247-255. Enders, A., Hanley, K., Whitman, T., Joseph, S., Lehmann, J., 2012. 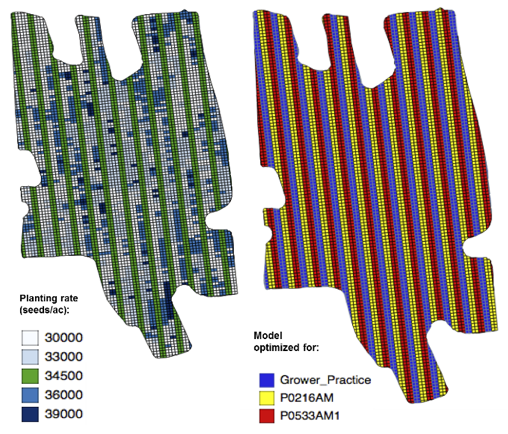 Characterization of biochars to evaluate recalcitrance and agronomic performance. Bioresource Technology, 114, pp.644-653. Wang, B., Lehmann, J., Hanley, K., Hestrin, R. and Enders, A. (2016) Ammonium retention by oxidized biochars produced at different pyrolysis temperatures and residence times. Royal Society of Chemistry Advances, 6, pp.41907-41913. Van Humbeck, J.F., McDonald, T.M., Jing, X., Wiers, B.M., Zhu, G. and Long, J.R., 2014. Ammonia capture in porous organic polymers densely functionalized with brønsted acid groups. Journal of the American Chemical Society, 136, pp.2432-2440. Mandal, S., Thangarajan, R., Bolan, N.S., Sarkar, B., Khan, N., Ok, Y.S. and Naidu, R. (2016) Biochar-induced concomitant decrease in ammonia volatilization and increase in nitrogen use efficiency by wheat. Chemosphere, 142, pp.120-127.